Place the beans in a medium stockpot, cover with water and bring to a boil. Boil for 2 minutes, remove from heat, cover and let soak for 1-1/2 hours. Alternatively, you can cover the beans with water plus about another 2 inches and leave to soak overnight. Drain well and set aside. Heat the stockpot over medium heat and add chopped bacon. Cook until softened. Add the chopped smoked sausage and cook until browned. Add the chopped onion and celery and continue cooking until softened. Add the garlic and cook for another minute or so. Stir in the basil, pepper and bay leaves. Return the beans to the pot. Stir well, add the chicken stock and mix in, bring to a boil, cover, reduce heat to simmer and simmer covered for 45 minutes to an hour. 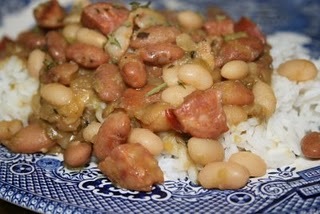 Check the beans to see if they have softened, add salt, adjust seasonings as needed.